Mold is a pesky household problem, one many homeowners hate to face. Dealing with it, however, is a must and knowing more about mold can be helpful. Many people have a lot of questions when they discover this particular problem in their homes. These questions are designed to give simple, informative answers to those questions. Q.) Why does mold grow in a home? A.) 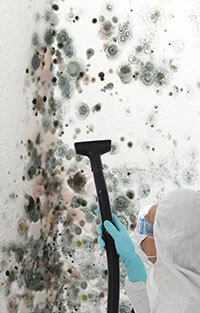 Mold thrives in warm, dark, damp climates. The inside of a house provides many spaces where it experiences an ideal environment, including crawlspaces, the inside of walls, and underneath carpeting. Q.) Where does the moisture come from? A.) There are a few sources. One of the most obvious is flooding. After a storm or a flood, water sits in the home and soaks into the carpet and walls. This water damage is a frequent source of mold. Without prompt water extraction, mold will grow in those spaces. Another source could be from leaky plumbing, which causes water to build up and provide mold with the medium it requires. A third source is from carpet cleaning. The carpeting should be completely dried out after every cleaning, otherwise, the lingering dampness could trigger mold damage. Q.) Can it cause health problems? A.) It can. Many people are allergic to mold and if they breathe it in, they will suffer an allergic reaction. Some of those reactions are very similar to outdoor allergies, such as sneezing, a runny nose, reddish eyes, and maybe a skin rash. People who are allergic and suffer from asthma may also come down with an asthma attack. There are a few types of mold which are toxic as well, but no type is pleasant once it settles and begins to grow. Q.) How do I prevent mold from growing in my home? A.) There are a few simple steps any homeowner can take to prevent mold from growing in their home. When using a carpet cleaning service make sure to let the carpet fully dry after you finish by opening windows, blowing fans, and doing whatever it takes to keep the air circulating. Investing in dehumidifiers will reduce the humidity in your home by 30-60% and prevent the ambient moisture levels mold needs in order to thrive. Make sure that all areas of your house, including the attic and any crawlspaces, are fully ventilated and free from excess humidity. All these simple steps will reduce the chances that your lovely home also becomes a lovely home for unsightly spreads of mold.